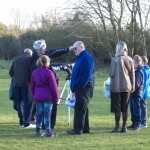 Crowds descend upon Junior Stargazing Live! 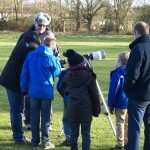 The King’s Lynn & District Astronomy Society held a Junior Star Gazing Live event at Tottenhill Village Hall on Saturday 17th January which was aimed at introducing children to the pleasures of astronomy. The age group we aimed to attract was from 5 to 16 years of age. The scheduled time for the event was 2.00pm to 6.oopm and as this was the first “Junior” event we unsure of how well it would be attended, we were therefore very pleased when by 2.10pm we had 30 people through the gates. 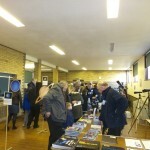 The final tally of visitors was 253 with the final visitors leaving at 6.20pm so we can safely say that it was a very successful event albeit a tiring one for the KLADAS members who set up the exhibits, telescopes and made the teas and coffees. We had visitors from schools, scouts as well as the general public and everyone seemed to enjoy the day and we had a lot of enquiries from people asking how much it costs to join and how often we have talks and observations so we are quietly confident that we will see an increase in the future membership. We had a couple of people who had brought their telescopes which they had either been given or recently purchased and we managed to set them up for them and invite them to come to one of the observation nights to have further instruction in how to get the best from their telescopes. 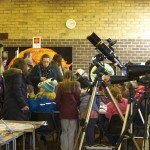 We had set up models of the planets in the solar system along the length of the village hall, books on astronomy, competitions, computers running free astronomy software that anyone can download onto their computers at home & will show them what they can see in the night skies. 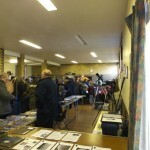 We had astrophotographs taken by members of the Society on display. 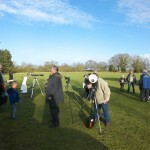 Telescopes were set up outside, two of which had solar filters so the visitors could look at the sun and see sunspots whilst the sun was out. We had set up a photograph of Pluto some 300 yards away so that telescopes without solar filters could be used to show the magnification of our telescopes and binoculars. When the sun went down we used the telescopes to look at objects in the night sky e.g. M42 the Pleiades, the constellation of Orion etc. 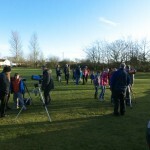 The adults as well as the children were fascinated by just how many stars are visible through a telescope compared with those visible with the naked eye. 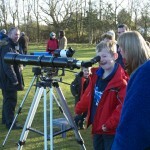 The next Open day will be March 21st 2pm-8pm to co-incide with BBC’s Stargazing Live 3 day programme. The theme will be the Sun and the Moon. Astronomers using data from NASA’s Kepler mission have discovered a planetary system of five small planets dating back to when the Milky Way galaxy was a youthful two billion years old. The Kepler-444 system is approximately 117 light-years away toward the constellation Lyra. 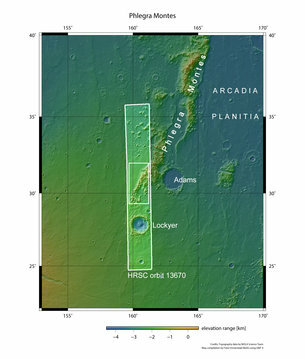 A paper reporting this discovery is published in The Astrophysical Journal. Comet Lovejoy, glowing at 4th magnitude, is now in its best two weeks. It’s nicely placed high in the early-evening sky for your binoculars or low-power, wide-field telescope. It may be dimly visible to the unaided eye under excellent dark-sky conditions — if you know exactly where to look! Comet Lovejoy, C/2014 Q2, is now having its best two weeks for skywatchers. It’s 4th magnitude, about as bright as it’s predicted to get. Use the finder charts at the bottom of this page to find its location among the stars. Although 4th magnitude would technically make it a naked-eye object, its diffuse fuzziness means that most viewers, who live under light pollution, will probably still need binoculars. The study presents the velocity dispersion of young, intermediate-age, and old stars in the disk of Andromeda, the first such measurement in another galaxy. A detailed study of the motions of different stellar populations in the disk of the Andromeda Galaxy has found striking differences from our Milky Way, suggesting a more violent history of mergers with smaller galaxies in Andromeda’s recent past. Researchers have used a new method to measure the distance to the active spiral galaxy NGC 4151 — whose core is dubbed the “Eye of Sauron” because of its resemblance to the structure in the “Lord of the Rings” films — with unprecedented precision. This calculation enabled them to determine the mass of NGC 4151’s central black hole more accurately — and the results were surprising.